CABLE HIGHLIGHTS: VH1 retained its Wednesday cable lead, although BLACK INK CREW was down 0.07 to 0.50, and HIP-HOP SQUARES was at 0.29/0.29 compared to last week’s 0.40/0.39. Bravo’s REAL HOUSEWIVES OF NYC gained 0.02 to 0.46. On TLC, DR PIMPLE POPPER lost 0.04 to 0.46, and MY 600-LB LIFE was down 0.05 to 0.20. It was another strong night for MSNBC’s RACHEL MADDOW SHOW at 0.36/0.52/3.1M, with Fox News’s HANNITY at 0.27/0.51/3.1M, and CNN’s ANDERSON COOPER 360 at 0.24/0.33/1.2M. On MTV, CATFISH rose 0.03 to 0.36, with a TROLLS follow-up at 0.31. TBS’s FULL FRONTAL returned at 0.32. Paramount’s YELLOWSTONE fell 0.06 to 0.31. On HGTV, HOUSE HUNTERS edged up 0.02 to 0.31, PROPERTY BROTHERS held at 0.30, and HOUSE HUNTERS INTL ticked up to 0.30. Comedy Central’s DAILY SHOW had an unusual Top 14 airing at 0.28. On USA, SUITS had a 0.28 season premiere, down 0.08 from summer 2017, and COLONY was up 0.03 to 0.16. On A&E, OZZY & JACK’S WORLD DETOUR climbed 0.06 to 0.27, and WAHLBURGERS ticked down to 0.15. On ID, REASONABLE DOUBT ticked up to 0.25, and BROKEN TRUST was up 0.02 to 0.22. 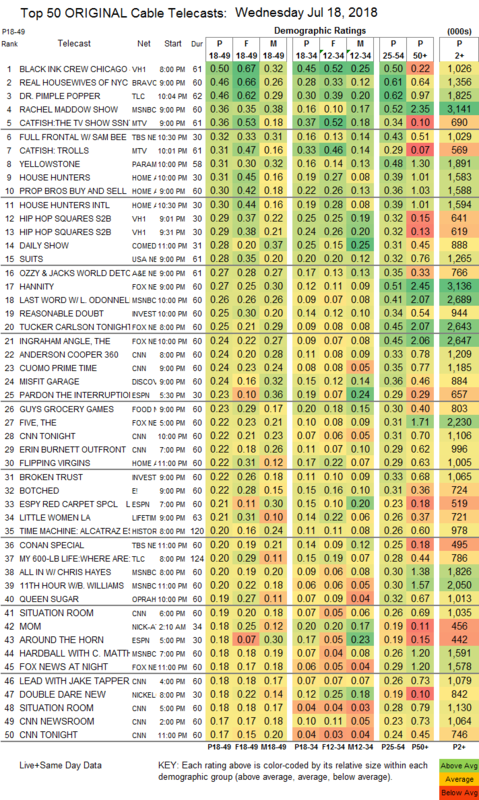 On Discovery, MISFIT GARAGE slipped 0.02 to 0.24, and STICKER SHOCK ticked up to 0.16. Food Network’s GUY’S GROCERY GAMES dropped 0.04 to 0.23. 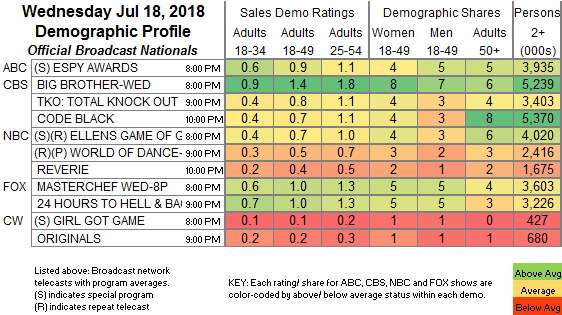 E!’s BOTCHED was steady at 0.22. On Lifetime, LITTLE WOMEN fell 0.02 to 0.21, and SEATBELT PSYCHIC was at 0.09/0.08 compared to last week’s 0.10/0.09. OWN’s QUEEN SUGAR dropped 0.08 to 0.19. History’s SIX lost 0.04 to 0.15. On Freeform, YOUNG & HUNGRY was at 0.08/0.08 compared to last week’s 0.15/0.14. El Rey’s LUCHA UNDERGROUND, still off the chart, was steady at 0.03/135K.